JOHANNESBURG, July 1 (Reuters) – South Africa’s Barclays Africa Group has appointed former Tiger Brands CEO Peter Matlare as its deputy chief executive, the bank said on Friday. Matlare, who spent seven years at the helm of the country’s biggest consumer goods manufacturer until December last year, will have responsibility for the bank’s banking operations in the rest of Africa, Barclays Africa said in a statement. The former Tiger Brand chief executive, who has been a director of Barclays Africa since 2011 will start his new role on August 1, the lender said. (Bloomberg) — Barclays Africa Group Ltd. appointed Peter Matlare as deputy chief executive officer and said investment banking head Stephen Van Coller will leave as South Africa’s third-largest lender makes changes to its top management structure. Matlare, the former CEO of food producer Tiger Brands Ltd., will be responsible for Barclays Africa’s operations outside its home market, while David Hodnett will continue in his role as deputy CEO, focusing on South Africa, the Johannesburg-based company said in a statement on Friday. Van Coller, who has been at Barclays Africa since 2006, will quit the banking industry when he leaves the company at the end of September, a spokeswoman for the lender said by phone, declining to be identified in line with company policy. At Tiger Brands, Matlare presided over a decline in full-year net income and a writedown in the value of the company’s Nigerian milling unit. He resigned from the maker of All Gold tomato sauce and Black Cat peanut butter last year. Matlare has been a non-executive director of Barclays Africa since December 2011, the company said. The moves come as Barclays Africa’s London-based parent gradually sells down its holding in the lender formerly known as Absa, reducing its stake to 50.1 percent earlier this year, to conserve capital. Ex-Barclays CEO Bob Diamond said in April he and investors including U.S. private-equity giant Carlyle Group LLP are working on a potential bid for the bank, while Dubai-based Abraaj Group is also planning an offer, people familiar with the matter said in May. The Public Investment Corp., Africa’s biggest fund manager, has said it will pull together a group of black investors to buy a stake to ensure the bank comes back under the control of South Africans. 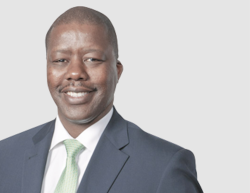 Barclays Africa Group Ltd (BAGL) is pleased to announce the appointment of Peter Matlare as Deputy Chief Executive Officer with responsibility for our rest of Africa banking operations with effect from 1 August 2016. He will remain on the Board but change from non-executive to executive director. The appointment of a Deputy CEO and Executive Director to oversee the rest of Africa business underscores Barclays Africa’s strategy to grow across all its markets in Africa. “Barclays Africa is a robust business with excellent growth opportunities on the African continent. I am delighted to join a team that has delivered sustainable and strong returns for shareholders on the back of a sound and differentiated strategy, and I look forward to contributing to its success in a new role on the Executive Committee,” said Matlare. The responsibility for rest of Africa previously fell under the portfolio of David Hodnett, the Deputy Chief Executive Officer and Financial Director of BAGL. David Hodnett shall continue as Financial Director and Deputy Chief Executive Officer of BAGL, but with responsibility for the South African [banking] businesses, which make up a substantial part of Barclays Africa. This includes Retail and Business Banking and the Corporate and Investment Bank. Craig Bond will continue in his role as chief executive of the retail and business bank (RBB) and a member of the Barclays Africa executive committee. Stephen Van Coller, CEO of Barclays Africa Corporate and Investment Bank, will retire from banking with effect from 30 September 2016.